Hey! 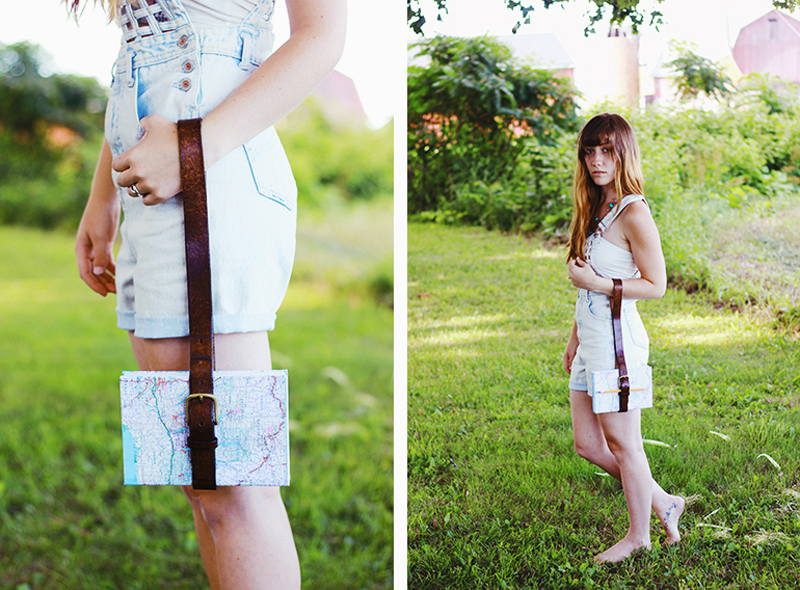 My name is Caitlin, I am a vintage-loving, craft-making lady that likes to spend a lot of time behind a camera. I share a lot of pictures and thoughts over on The Merrythought, where I blog with Manda and Marla! 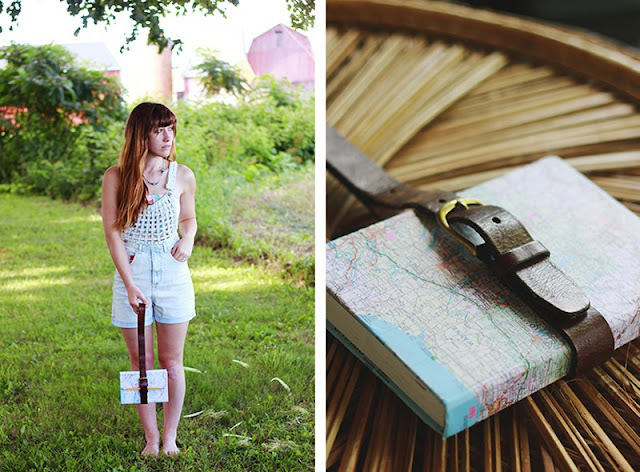 I adore Courtney's style and I am so excited to be here sharing a quick DIY today! 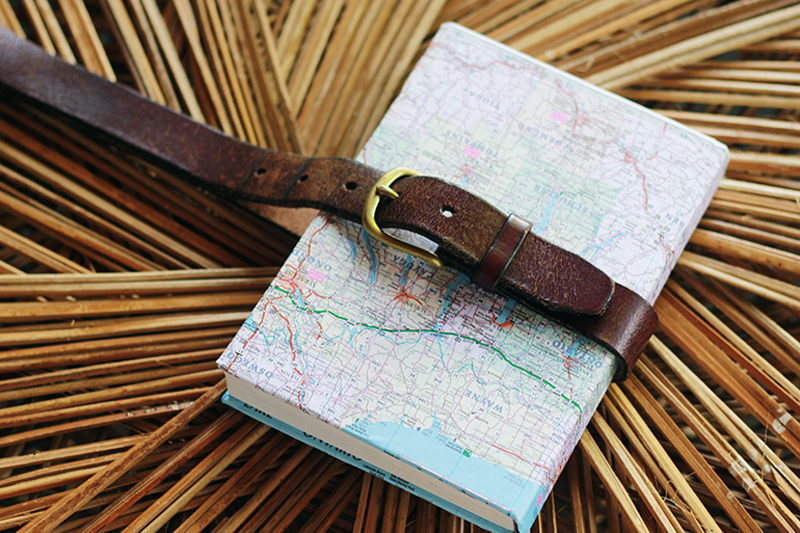 -Lay your book out flat on the backside of the map that you want to use. Trace a line about 1/2" around the entire outside of the book. Cut out this line. -Use the paintbrush to coat the backside of the map in Mod Podge. Stick to your book and smooth. Fold excess paper carefully in to stick to the inside cover. -Use a strong super glue to glue the buckle part of the belt to the front cover. (Do not put super glue around the binding it will make the book hard to open.) This is also where I chose to use a shortened upholstery tack for extra support and added cuteness! -Wrap belt around the book and put another dab of super glue to stick it to the back cover. I chose to leave my belt long so that I could hold it around my wrist and carry it on hikes with me! You can customize that part however you would like though - just cut it short and poke a hole in the leather so that you can buckle it. 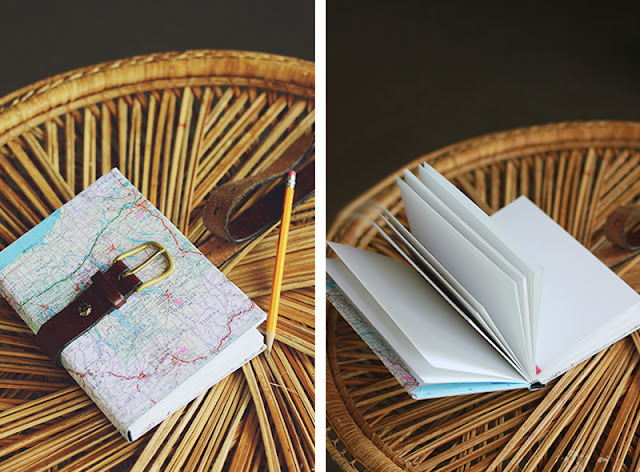 Makes a great travel journal or a fun gift for an adventure-loving friend! Isn't this so great? Thanks so much Caitlin for sharing. I'm always so impressed by your crafty tutorials. Be sure to check out The Merrythought for other great DIYs and follow Caitlin, Marla & Manda along. They are some of my favorites. Oh my goodness! 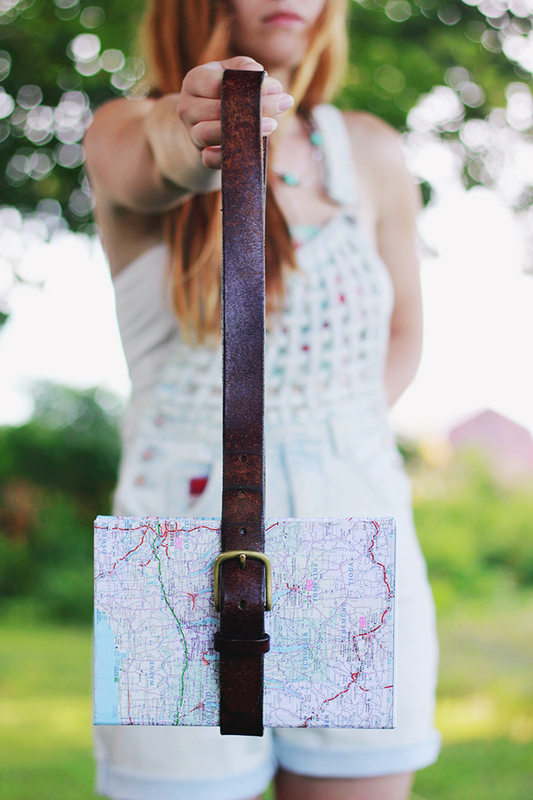 I have begun to have such a huge map obsession (late summer wanderlust maybe) and this is perfect! I was actually admiring a map notebook at barnes and nobles, but walked away (ran away) when I saw the price. Definitely making this! also, those are some sweet overalls. This is the sweetest! Found you through craftgawker cuz your cute project was right around mine! Now I'm a follower! I heart everything maps and want to try this! sub zero repair Santa Barbara Waking up to a flooded laundry room from your washing machine or flooded kitchen from your dishwasher does constitute an appliance emergency. As with any and all emergencies you should remain calm and this time you can rest assured when you call out for help, Santa Barbara’s best appliance repair team will be at your home in record time. Santa Barbara Appliance Repair has a great team of certified appliance repair professionals ready to help you get your appliance back to working order. The expert trained staff can tackle any repair from a small part replacing to a major rebuild. Each one of Santa Barbara Appliance Repair experts has vast knowledge and experience to help you in your appliance need. Getting Instagram remarks can be utilized to ascertain your name, attract extra prospects and increase the conversation among your enterprise and your enthusiasts. You can buy IG comments to encourage Instagram people that the offers are powerful. Posts using a enormous number of likes are looked upon as common and influential. They persuade others to adhere to the profiles from the place the posts arrived from. Next this strategy may help your posts get appreciation from the sort of feedback. buy instagram comments and likes The publicity wanted by your giving are going to be provided as well. When other Instagram customers notice the popularity of one's posts, they’ll be amazed and be part of your lover club. 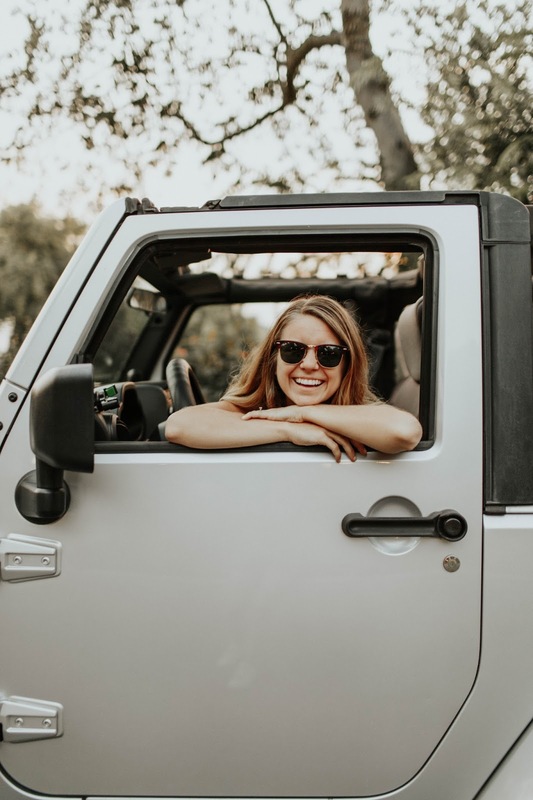 Put simply, once you buy feedback on Instagram, it is possible to help save precious time and go away a strong influence on your target audience. SO cute!!! It’d be a perfect travel notebook or a wishlist of places to go and people to meet! 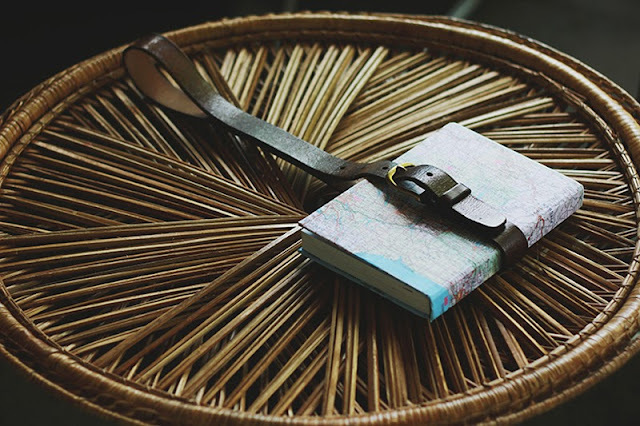 Perfect way to make a book bel to carry diary anytime with us,thanks for share this with us.I just glad to be here and to discover this awesome post.